Dozens of beachgoers banded together in Cape Cod in an attempt to save a 14-ft great white shark, after the powerful predator found itself helpless and suffocating on the sand. The helpers dug a trench around the creature which extended out to sea on Whitecrest beach in Wellfleet, Massachusetts. Some stood around the shark and doused it with water, while others tied a bright yellow cord around the animal. 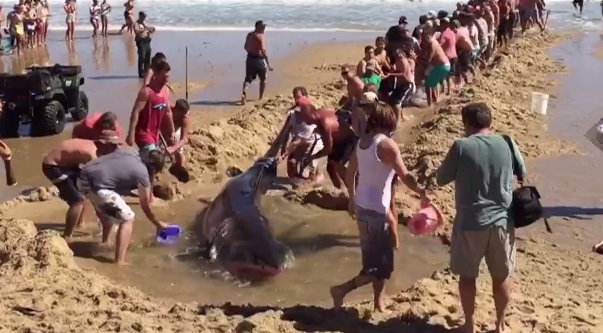 Footage of the operation shows the crowd cheering and whooping as dozens of people grab onto the rope and pull the shark, believed to weigh 2,000lbs (900kg), out to sea. An official is seen shouting at those gathered at the spot in order to disperse the crowd away from the shore. Robyn Schnaible, who filmed the video, wrote on Vimeo that the rescuers tied one end of the rope around its tail while the other end was attached to a boat. Responses to "Dozens of beachgoers come together to save 14ft great white shark"
hurray for all the people who love life and animals. hurray for running toward the water with a shark in it. hurray for breaking all the rules, but following the sacred law.